When you start to wrap a gift, you aim to make it look like Martha Stewart's handiwork -- but then it ends up looking like your 5-year-old got into the paper, scissors and tape. Wrapping a gift, as easy as it seems, is deceptively tricky, particularly if the item is an irregular shape. Given the right tools, the perfect gift wrap is easier than you think. The easiest gift to wrap is one that comes in a box, but that puts the pressure on to make it look extra good. Gather the appropriate tools, including wrapping paper, a proper cutting tool, tape, and any ribbons or accoutrements for flair. MarthaStewart.com recommends using a T-square to help make straight cuts, as well as double-sided tape so you don’t see the tape itself. If you don’t have any wrapping paper, use Kraft paper topped with festive ribbon. To avoid tearing the paper, wrap on a hard surface rather than on carpet. Place the gift face-down so the seam is on the bottom. Don’t use too much paper, which causes sloppy folding; instead, the ends of the wrapping paper, once cut, should overlap by just a couple of inches. Fold the sides of the paper in, and fold the top and bottom flap to meet in the middle. Secure with the double-sided tape. If you’ve ever tried to wrap a mug, you know the frustrations of wrapping irregularly shaped gifts. Rather than messily wrapping them as is, find a way to creatively package the gift for a smoother surface. A small gift, such as perfume, can be surrounded by bubble wrap and inserted in an empty paper towel roll. A medium-sized gift can go in any clean container you have around the house, whether it’s a shoebox or empty coffee can. If you’re wrapping soft items -- such as sweaters or scarves -- without a box, place the item on top of a piece of cardboard cut to size. This gives you a hard surface to wrap around and helps to prevent ripping. 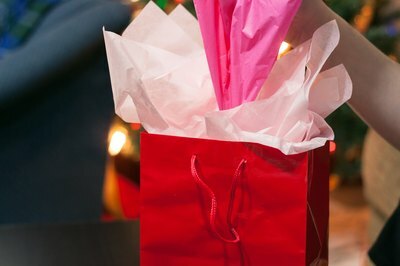 A 2009 survey by Scotch brand tape found that rather than bother with wrapping an item, one in five gifters will stuff the present in a gift bag. Here’s how to make that gift bag stand out: Place the item in the bag, then hold a piece of tissue paper in the middle. Fold it so the paper makes a cone shape; then put the narrow end of the tissue paper in the bag. Repeat with other pieces of tissue paper in additional colors, if desired, until the bag is full. If you want to display the items in a gift basket, fill the basket with shredded paper or tissue paper, prop the items on top and place the basket in the center of a circle of netting or two crossed lengths of cellophane. Bring the netting or cellophane up to the top of the gift basket and gather it in one hand. Wrap a piece of wire or ribbon around the top. Going the extra mile in wrapping a package makes the whole gift seem more festive. 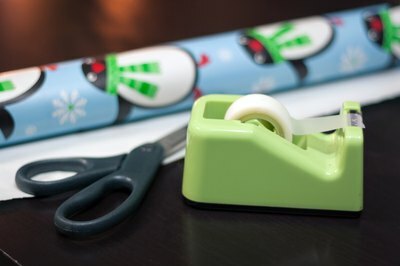 Instead of using standard scissors when cutting gift wrap, use a rotary cutter fitted with decorative edges to make fancy cuts. Swap out standard curling ribbon for wide cuts of fabric ribbon, or make oversized bows out of extra strips of wrapping paper. If you find your wrapping skills are somewhat abysmal, use decorative tape -- it looks festive, even if it’s not as sharp as you’d like.